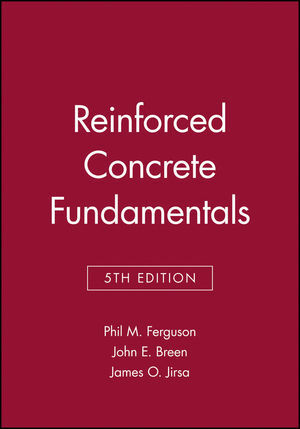 This Fifth Edition maintains the basic Ferguson approach in which design procedures stem from and provide the basis for a clear understanding of the behavior of reinforced concrete. Behavior of reinforced concrete members and assemblages at every load stage is illustrated with illustrations and photos, and calculation models that relate to the physical behaviors are provided to help students and practitioners recognize and assess various design situations. To avoid confusion, many of the examples now use customary or English units, rather than SI units as in the Fourth Edition. This edition conforms to the technical changes in the '83 and '86 revisions to the ACI Building Code. In this edition, service load analysis of stresses, computuations of deflection and distribution of reinforcement to control crack widths have been incorporated with the sections that treat analysis and design of flexural members. Material relating to seismic design has been revised and expanded, and more emphasis has been placed on developing conceptual models for design. About the authors The late Phil M. Ferguson was The T. U. Taylor Professor of Civil Engineering at the University of Texas at Austin. He was the sole author of the previous four editions of Reinforced Concrete Fundamentals. John E. Breen holds the Nasser I. Al-Rashid Chair in Civil Engineering at the University of Texas at Austin, where he was Director of the Phil M. Ferguson Structural Engineering Laboratory from 1967-85. He received his PhD at the same institution in 1962. James O. Jirsa is The Phil M. Ferguson Professor in Civil Engineering at the University of Texas at Austin and Director of the Phil M. Ferguson Structural Engineering Laboratory. He received his PhD from the University of Illinois in 1963. Flexural Analysis and Serviceability of Beams. Axial Load Plus Bending--Short Columns. Development and Slicing of Reinforcement. Continuous Beams and One-Way Slabs. Two-Way Slabs on Stiff Beams. Strip Method for Slab Design. Flat Plates and Flat Slabs. Interaction of Two-Way Slab Systems with Beams and Columns. Distribution of Concentrated Loads and Other SpecialProblems.